If you believe you have a book inside you just waiting to come out, here is a guide that will ensure your book's arrival in the world. I had a contract but not the first clue how to transact a book. Every morning I tried to move walls with my forehead. I wanted answers and I wanted them yesterday. Mary showed me I wasn't yet ready to ask the questions. More importantly, her method provided an invaluable blueprint that, I suspect, will be useful for every book I write. Mary's suggestions enabled me to take material I'd been struggling with and look at it with new eyes. A first-time book-writer's best companion. With specific advice, focused writing exercises and generous encouragement, her clear, personal voice guides developing writers through the process, from first steps to final launch. They—and their future readers—will be grateful. 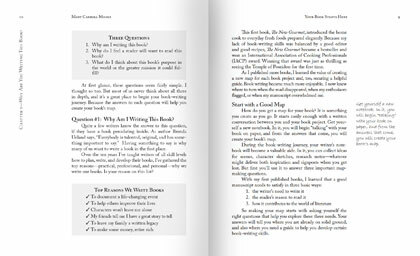 Mary Carroll Moore offers the most practical book development process I have ever seen. As a first-time author, I found her easy-to-follow guide exactly what I needed to take my idea from a dream to a completed manuscript. More than simply sharing a writing process, she laid out the ground rules, provided a clear step-by-step process, and showed me how to move forward with confidence. Help! I want to write a book—how do I begin? 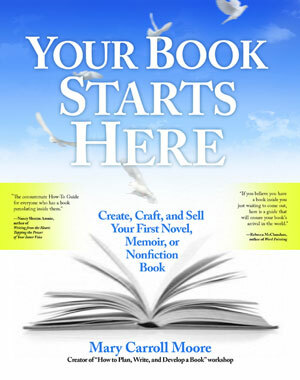 Take your novel, memoir, or nonfiction book from idea to print! Finally, sound, easy-to-follow advice on the ins and outs of book writing: everything from writing practice to pacing your prose. Dozens of specific book-writing exercises to generate ideas, flow chapters, and keep you writing, plus expert up-to-date advice on today's publishing industry. The consummate How-To Guide for everyone who has a book percolating inside them. Why it's essential to know your reader—before you write your book!